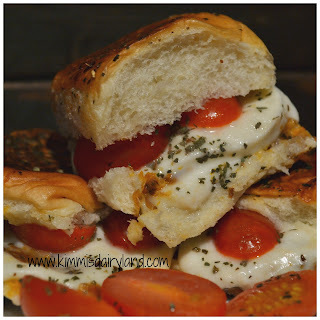 If Caprese Salad is one of your go-to's at Italian restaurants, you will love this spin off of the traditional slider recipe. Melty mozzarella, dried basil (or fresh if you prefer), grape tomatoes dipped in balsamic vinegar... all on a Sweet Hawaiian roll. These are perfect for lunch or appetizers. A few months ago, we hosted some of my friends for dinner and had barbecue sliders. It was delicious and everyone had a great time. This group of friends mostly comes from agriculture. One of the ladies grew up on a dairy farm in Wisconsin; another on a beef farm in Virginia; and the other friend used to be my neighbor. She's great and puts up with all of us talking farming all the time. We are all very passionate about agriculture, but none of us farm exactly the same way and we don't agree on absolutely everything. That's the great thing about agriculture. While there are plenty of choices in the grocery store for you, there are also many production methods for farmers to accomplish the same goal of taking excellent care of their animals and producing a healthy, nutritious and safe food supply. Choice is a good thing. 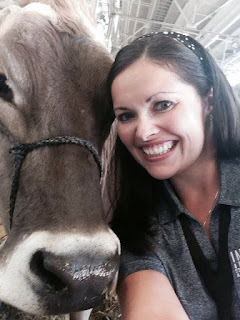 When talking about dairy farms, the cows may be out on pasture, they may live in a free stall barn where they can lay down in any stall they want and have constant access to feed and water, or they may live in a pack barn without stalls where they can also choose where to lay down and they have around the clock access to feed and water. There are so many ways to do a great job taking care of animals. For more about how dairy farmers take care of their cows, check out this post. At the end of the day, farmers all work hard. Farming is not easy work and it takes a lot of time and dedication. Those that aren't dedicated usually don't last very long in this business. Cows don't take holidays and they can't read a clock. You can plan all you want, but ultimately those cows may make you late for an event or two (or a lot more than that!). However, ask anyone who farms and they likely will tell you they don't want to do anything else. This passion is passed down from generation to generation with the farming legacy. As you get together with your family and friends this summer, take some of these sliders! They are sure to be a hit. Using medium heat, watch the level of browning on the bottom of the slider buns. The goal is to be slightly brown and to melt the cheese.